The inaugural Celebration of Sepsis Heroes, held in 2012, honored five people and organizations for their work in raising sepsis awareness. 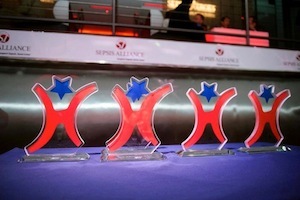 One honoree was Spike Out Sepsis, an annual event that raises sepsis awareness and funds for Sepsis Alliance. Co-founders Jennifer MacDermott and Alicia Rendon, both nurses, accepted the award. In 2013, GE Healthcare Education Services was presented with a Sepsis Hero Award because of its push for sepsis education in their Nursing Library of Online Education, including their video Communication: Sounding the Alarm for Sepsis. Their work has allowed nurses from all over the world benefit from information that they may otherwise not be able to access. GE Healthcare also provides scientific posters and professional education sessions about sepsis at professional conferences, such as at the American Association of Critical Care Nurses. Tom Ahrens, PhD, RN, FAAN, 2016. Laura Messineo, RN, MHA, 2014. In 2015 and 2016, Sepsis Alliance celebrated National Nurses Week by inviting members of the public to nominate a nurse who they felt went above and beyond to help patients with sepsis and increase sepsis awareness and education in their facilities as well as the community.